For all its hype, the phenomenon of big data and its attendant analytics is nevertheless changing what it means to be human. This talk explores the ontological dimensions of this change with a view to teasing out the impacts of its long term historical trajectory and the ethical design issues which arise. 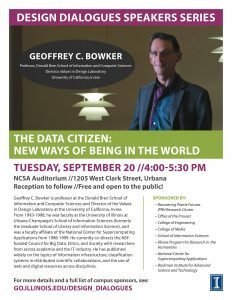 Geoffrey C. Bowker is Professor at the Donald Bren School of Information and Computer Sciences and Director of the Values in Design Laboratory at the University of California, Irvine. From 1993-1998, he was faculty at the University of Illinois at Urbana-Champaign’s School of Information Sciences, and was a faculty affiliate of the National Center for Supercomputing Applications from 1998-1999. He currently co-directs the NSF-funded Council for Big Data, Ethics, and Society with researchers from across academia and the IT industry. He has published widely on the topics of information infrastructure, classification systems in distributed scientific collaborations, and the use of web and digital resources across disciplines. This entry was posted in Uncategorized by achan@illinois.edu. Bookmark the permalink.